The Prem-i-Air EH1235 30" (75 cm) Portable Drum Fan is ideal for large venue cooling and drying and is easy to manoeuvre with the large easy grip handles and wheels. 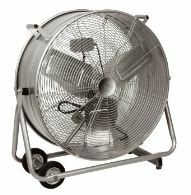 The low and high settings and full tilt adjustment mean that a controlled flow of air can be directed wherever needed. For full peace of mind the unit also has an automatic overheat cut-out function.